The Crab Nebula, which contains the Crab Pulsar. Image combines optical data from Hubble (in red) and X-ray images from Chandra (in blue). NASA/CXC/ASU/J. Hester et al. SNR G184.6-05.8, 2C 481, 3C 144.0, SN 1054A, 4C 21.19, NGC 1952, PKS 0531+219, PSR B0531+21, PSR J0534+2200, CM Tau. 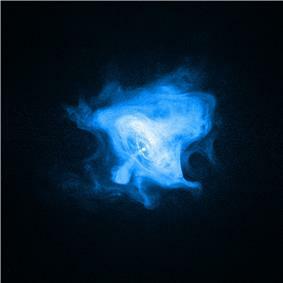 X-ray picture of Crab pulsar, taken by Chandra. The Crab Nebula was identified as the remnant of SN 1054 by 1939. Astronomers then searched for the nebula's central star. There were two candidates, referred to in the literature as the "north following" and "south preceding" stars. In September 1942, Walter Baade ruled out the "north following" star, but found the evidence inconclusive for the "south preceding" star. Rudolf Minkowski, in the same issue of Astrophysical Journal as Baade, advanced spectral arguments claiming that the "evidence admits, but does not prove, the conclusion that the south preceding star is the central star of the nebula". In late 1968, David H. Staelin and Edward C. Reifenstein III reported the discovery of two pulsating radio sources "near the crab nebula that could be coincident with it" using the 300-foot Green Bank radio antenna. They were given the designations NP 0527 and NP 0532. The period and location of the Crab Nebula pulsar NP 0532 was discovered by Richard Lovelace and collaborators November 10, 1968 at the Arecibo radio observatory. A slow-motion movie of the Crab Pulsar taken at 800 nm wavelength (near-infrared) using a Lucky Imaging camera from Cambridge University, showing the bright pulse and fainter interpulse. A subsequent study by them including William D. Brundage also found that the NP 0532 source is located at the Crab Nebula. A radio source was also reported coincident with the crab nebula in late 1968 by L. I. Matveenko in Soviet Astronomy. Optical pulsations were first reported by Cocke, Disney, and Taylor using the 36-inch telescope on Kitt Peak of the Steward Observatory of the University of Arizona. Their discovery was confirmed by Nather, Warner, and Macfarlane. Jocelyn Bell Burnell, who co-discovered the first pulsar PSR B1919+21 in 1967, relates that in the late 1950s a woman viewed the Crab Nebula source at the University of Chicago's telescope, then open to the public, and noted that it appeared to be flashing. The astronomer she spoke to, Elliot Moore, disregarded the effect as scintillation, despite the woman's protestation that as a qualified pilot she understood scintillation and this was something else. Bell Burnell notes that the 30 Hz frequency of the Crab Nebula optical pulsar is difficult for many people to see. The Crab Pulsar was the first pulsar for which the spin-down limit was broken using several months of data of the LIGO observatory. Most pulsars do not rotate at constant rotation frequency, but can be observed to slow down at a very slow rate (3.7e-10 Hz/s in case of the Crab). This spin-down can be explained as a loss of rotation energy due to various mechanisms. The spin-down limit is a theoretical upper limit of the amplitude of gravitational waves that a pulsar can emit, assuming that all the losses in energy are converted to gravitational waves. If no gravitational waves are observed at the expected amplitude and frequency (after correcting for the expected Doppler shift) is therefore a proof (assuming gravitational waves exist) that other mechanisms must be responsible for the loss in energy. The non-observation so far is not totally unexpected, since physical models of the rotational symmetry of pulsars puts a more realistic upper limit on the amplitude of gravitational waves several orders of magnitude below the spin-down limit. It is hoped that with the improvement of the sensitivity of gravitational wave instruments and the use of longer stretches of data, gravitational waves emitted by pulsars will be observed in future. The only other pulsar for which the spin-down limit was broken so far is the Vela Pulsar. 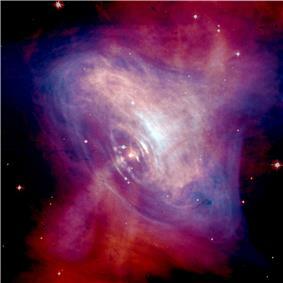 ^ "Space Movie Reveals Shocking Secrets of the Crab Pulsar" (Press release). NASA. September 19, 2002.